Join Avie and Stella in their magical playground. Everybody enjoys the company of these two. From Grandparents to grandchildren, time seems to fly when we all play together and allow our minds to get carried away - just a little bit. FAIRY GARDEN FAIRIES (approx. 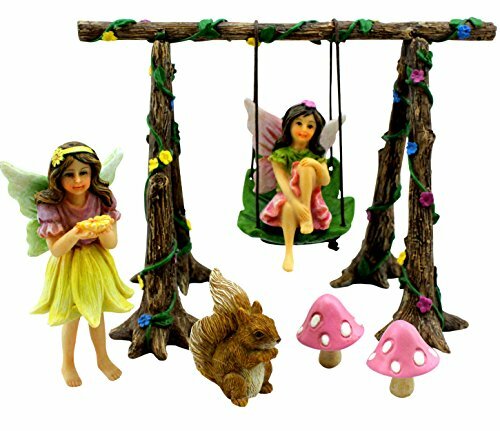 ): Avie, the standing fairy, is 3" and the fairy on the swing, Stella, is 2.5" high. MINIATURE ACCESSORIES: The Swing Set is 5.7" Wide and 4.33" High. The mushrooms are about 1.18" high and the squirrel is 1.4" high. If you have any questions about this product by Pretmanns, contact us by completing and submitting the form below. If you are looking for a specif part number, please include it with your message.